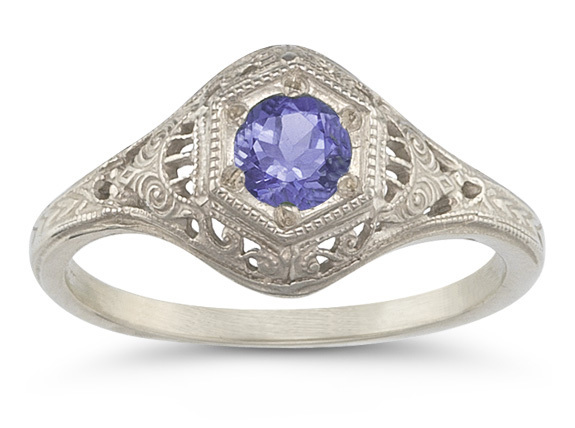 This unique vintage-style tanzanite sterling silver ring is not just the imaginative work of a jewelry designer, but made using authentic jewelry making-tools and hubs from the circa 1800s era. This would have been an exact design worn during this period by women of the era, reproduced using new materials. Crafted in .925 sterling silver, the center gemstone is a 4.5mm round "A" rated genuine tanzanite. This ring is also available in 14k white gold or as a bridal wedding ring set (shown below). We guarantee our Circa 1800s Style Vintage Tanzanite Ring in Sterling Silver to be high quality, authentic jewelry, as described above.